Usually RVing is very fun. However, sometimes you find yourself broken down in the middle of nowhere in Kansas. After an extensive time in Amarillo with Charlene, Amy, and Neil, I am on the road again heading to our Winnebago appointment in Iowa. Charlene is going to go to Austin and visit John and Michelle later in the week. Like all good RVers, I decided to totally change my route. Rather than going east to Arkansas and then turn north, I decided to head north of Amarillo and go through a new part of Kansas, catch part of Nebraska, and maybe a little of South Dakota while going to Iowa. I was enjoying driving and seeing the local sites through rural America. I had the satellite radio playing a classic rock station and was having fun listening to the beat. I saw numerous wind farms in Texas, the brief panhandle of Oklahoma, and Kansas. There were many, many agricultural fields. Some were corn, but others were crops I did not recognize. I had drizzle rain in Texas, fog in the southern section of Kansas, and later overcast skies as I moved north. After driving for 5 hours, I started looking for a truck stop were I could get diesel. The closest city was Salina, Kansas and it was right on my route. It is not a trivial task to tow a motorhome! However as I was driving, suddenly everything changed. The engine light went on, a message said I should stop the engine, and the overheating light went on. The engine temperature gauge was at the highest temperature possible. 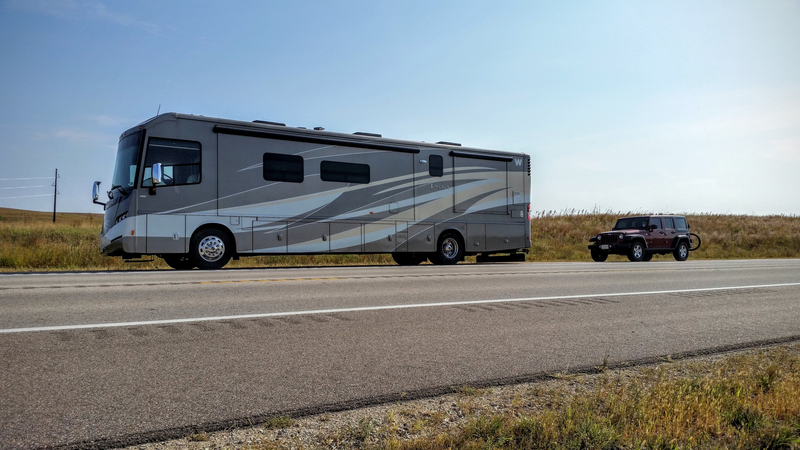 Fortunately, this two lane road had enough of a shoulder that I could immediately pull to the right and get the entire motorhome (barely) to the right of the white line. I think of all the driving I did earlier in the day where there was no shoulder at all and I would have been stuck in the middle of the lane of traffic. I got out of the motorhome and walked to the back and there was water dripping from the bottom of the motorhome. The hitch and front of the Jeep were all wet. Somewhere, I think a radiator hose broke, so the water was probably radiator fluid. It is complex to connect a large rig! I sighed and got out my card for CoachNet, our trusty roadside service that I had to call once before in Montana. They transferred me to one of their technicians who agreed that it sounded like it was radiator fluid and that the motorhome would need to be towed. CoachNet called back to say they found a nearby tow company that could come get me tomorrow morning. I told them that I was barely off the road in a remote section of Kansas and that I did not think that would be safe. 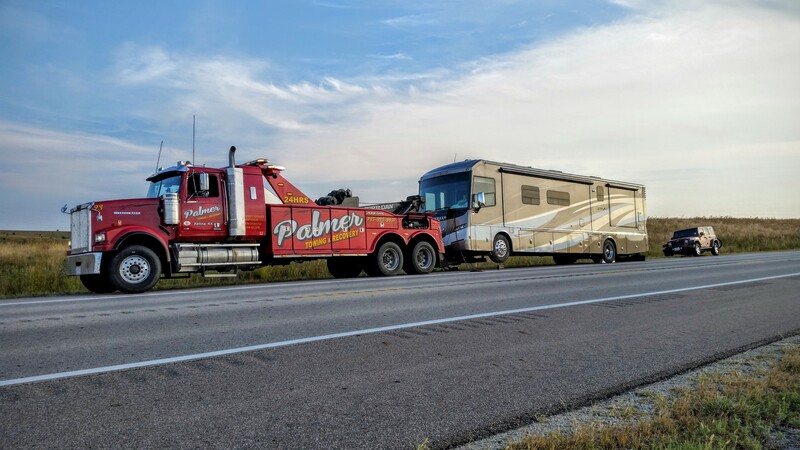 They called back a few minutes later that they found a tow truck in Salina that was large enough to tow the motorhome, but they could not get to me for 2 hours. So 3 hours after my initial call to CoachNet, this massive tow truck arrived. The tow truck driver told me to be patient because it was a big process to tow a large motorhome. He said he was very careful to do everything to not damage the motorhome. 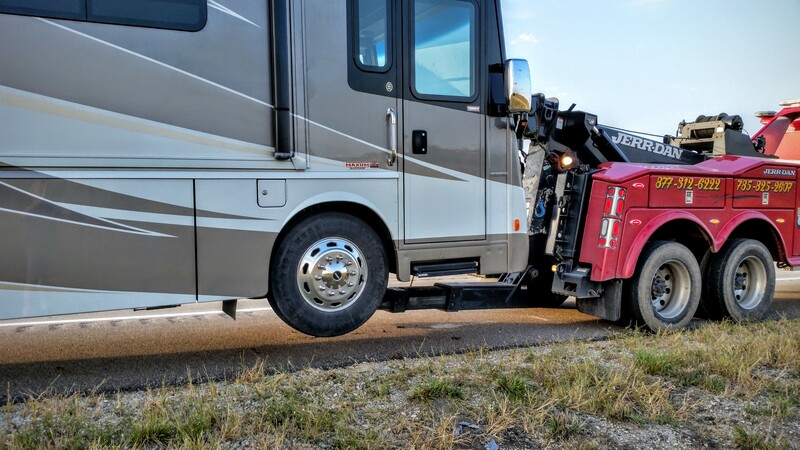 I was very impressed with everything he did to go through the whole process of getting the motorhome hooked up to the tow truck. It took just over 2 hours to get everything connected. He had to remove part of the drive shaft for towing and it was complicated to get the motorhome connected under the front axle. As we were getting ready to go, he gave me his cell phone number and said I should call him if I saw anything go wrong or suddenly saw sparks flying. I jumped in the Jeep and started following him. It took us an hour and 20 minutes to drive to the Freightliner dealer in Salina, Kansas. Next,it took an hour and a half to get the motorhome all unhooked and put back together. While the tow truck driver worked on the motorhome, I went inside the coach to get some food. This was 9:00 pm and I was absolutely starving. I had pre-cooked some salmon and boy a piece of cold salmon and a banana never tasted so wonderful! It was fantastic to eat something! The guy at the Freightliner dealer said I was welcome to sleep in the motorhome if I wanted but that they locked the gate at midnight and it stayed locked until 6:00 am. The guy finished unhooking the motorhome just after 10:00 pm and I started getting ready for bed. With all the stress, I fell asleep very quickly and slept until after 6:00 am.